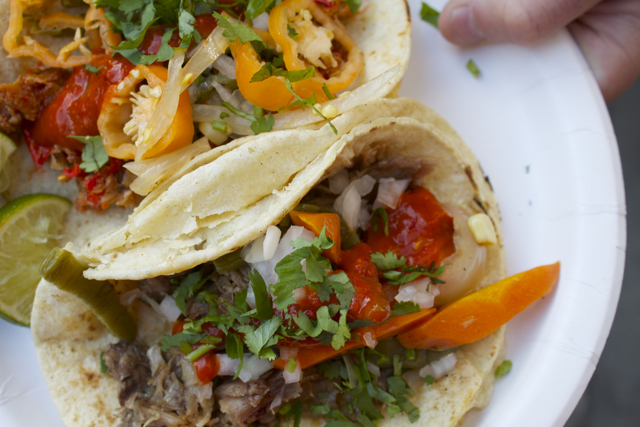 It’s no secret that we’re big fans of Ben Miller and Cristina Martinez’s weekend taco operation South Philly Barbacoa, but one must wake up early to experience it, since they typically sell out by noon or shortly thereafter. But now, on December 15th, all you night owls will get your chance to try some. Miller and Martinez are teaming up with Philly’s beloved mosaic artist, Isaiah Zagar, his wife, Julia, heirloom corn importer, Masienda, and chef Lucio Palazzo to throw a dinner party! Count on live music, free flowing beer from Victory Brewing, and a gorgeous set-up by Magpie Vintage, all in a venue that is just as exciting as the food. The event will occur at Zagar’s two story building on Watkins Street, just steps away from where South Philly Barbacoa sets up shop on weekend mornings. Zagar has been working for more than a decade on the building, covering every surface, floor to ceiling, with his well-known style of mosaic. The space is all but unseen by the public and ready for its debut, and what better way to celebrate it than with delicious food? Yes, you’ll be able to taste Cristina’s lamb barbacoa and pancita with handmade tortillas, and the bonkers lamb consommé we told you about, and Lucio Palazzo, chef de cuisine at La Calaca Feliz, will be curating the rest of the menu to feature maize from Masienda–a young importer of multicolored maize from smallholder farms in Mexico. The corn, already cropping up in some of New York City’s great restaurants, isn’t for eating fresh, but trust that it will show off some of the most exciting tortillas and tamales you’ll ever have encountered. There will be two seatings for the December 15th event, one at 6:00pm and one at 8:30pm. Tickets are $95 per person, to include food, alcohol, service, music, and art! Reserve yours here.